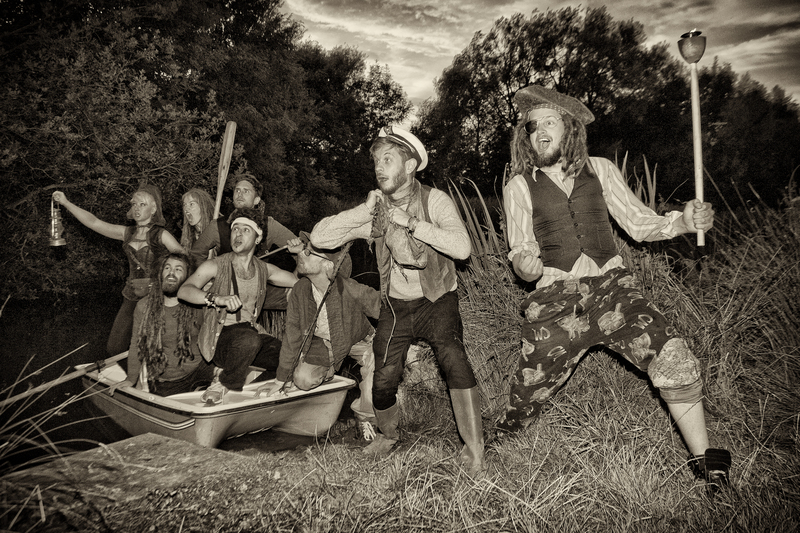 Seas of Mirth are a salty-smelling mega unit of sea dwelling reprobates with a mighty galleon of sound… landlocked in the East Midlands. Drums, retro organs, guitars, strings and bellows contribute to their invasive noises and the live shows draw you in with the aid of crowd-surfing crustaceans and a cataclysmic tug-of-war. The band feel equally at home in a vibrant, sweat-doused venue than they do on a majestic festival stage! Musically, it gets as diverse as a nautical prog-rock party band can get. The folk-based instruments cater for the rustic part of the sound, while the playful song writing and arrangements embrace the wilder element of the music. All marinated in maritime! Lyrically, songs include, for example, dealing with tempestuous sea conditions, gargantuous mythical beasts, mutiny, tales of severe intoxication and the old heart-crushing love song. Think of it as a sort of truncated nautical B-movie featuring a cast of characters raided from Hollywood’s worst costume department. Seas of Mirth started to emerge out of maritime-based songwriting and rum guzzling which occured in the late noughties between Cannonball Paul and Al Judders. Lots of stupidity ensued, TVs were thrown out of windows, the sound of a pump organ summoned the onslaught of earthquakes and surely after – the band was born. After playing a few gigs in the corners of pubs, caves, house parties and the like, people somehow started to appreciate the in-yer-face erratic nature of Seas of Mirth’s live show. Older sets used to include the songs ‘She’s In Love With A Man With A Hook For a Hand’ – a waltzy love number that progressed into primal chanting, and ‘The Ghost of Tom Jones’ where usually an audience member would berate the crowd dressed in a white bed sheet covered in knickers, and a Tom Jones mask. Early days indeed. Although we were starting to play at prestigious venues such as Wilton’s Music Hall and London’s SE1 club, we were still blagging it a bit. But it wasn’t too long before we started playing as a full band (yeah, with drums and everything). It happened when we were booked for a gig at Falmouth FXU Students Union. We were struggling to find any decent transport to get us there. A friend of our mandolin player offered to drive us down in his van, on the condition that he played drums. It was a late call, and he had no rehearsals whatsoe’er. Fortunately he pulled it out of the bag and smashed a 45 minutes set in front of a thousand screaming freshers. Good job, otherwise we would have died on our arses. Interesting fact: the girl who made the crab outfit is the daughter of the guy who played Zippy from Rainbow. Writing continued, dreads were cut off, wigs were lost, retro organs were bought, drummers changed, and we took a break at the end of that year to pen down the second album. It’s difficult to write when there’s nine of you, it’s essentially like writing for an orchestra. So it didn’t end up getting completely written for ages. Nevertheless, the gigs kept flowin’ and the oars kept rowin’. 2014 was our first time at Glastonbury, we played the Shangri-La Hell stage on a wet afternoon, to more than 20 people. Which for those conditions, is not too shabby! We returned to Europe that year too, playing a bit further afield this time and plundered Germany for the booty and wonderful grogs. Highlights were playing on the uninhabited island of Helgoland Dune, and getting a shoutout on national German radio! …and from fans too. If it wasn’t for the fans who do crazy shiz and make us piss our pants in laughter at the shows, this wouldn’t be happening and we wouldn’t be doing this and I wouldn’t be writing this bio. Respect! If you’ve managed to read all this, then double respect! Great to see you all at Salcombe Rugby Club at the weekend – Here’s a link to some photos I took at the gig.